First up, I’ve been doing some basic colouring of the Ximuria rough map I did last week. My goal was to pin down some more detail, and get some ideas of the relations between the areas on the map. The above map is my current initial colouring–really just some initial shading on the sea and a base colour for the land, with no attempt to show terrain or vegetation cover yet. But it’s looking a bit more alive. In particular it’s becoming obvious that there’s a huge difference between the northeast of Ximuria and the rest of the continent: the range of mountains variously now called the Jarnfjall, Khuldi, Ishbari, and finally Uttermost Mountains are a huge physical divide preventing easy movement between the two areas. There are passes and people, beings, and monsters do cross, but the mountains have kept the two sides apart for millennia. There are also climatic differences–there’s a northeast current bringing in cold water and air from the polar regions; and a southwestern current bringing in warm equatorial air and water. 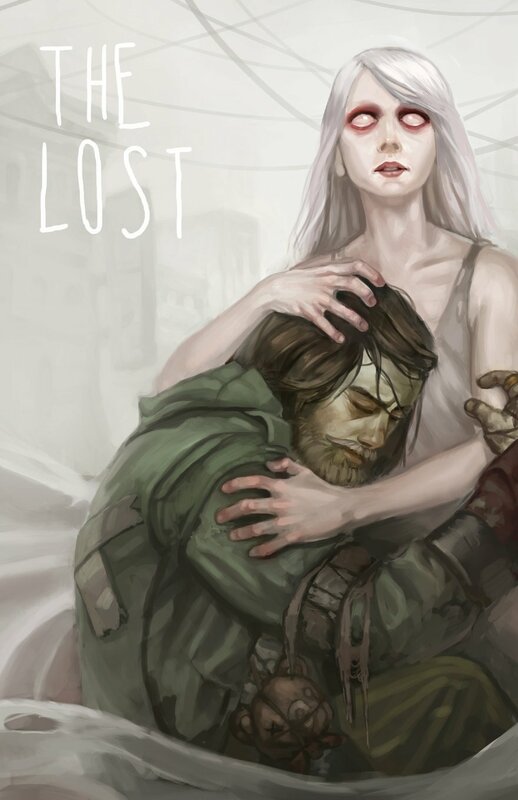 Together these account for the jungles of the Kla and Xinqari (more properly rainforests), the wetlands of Goblin Hinternesse, the Sea of Storms, and the cold of Urvang, land of the orc corsairs. I’ve also pinned down some city names, and zoomed in on some more local geography, particularly what’s going to be my core campaign area, the Wilderness of Toth. This used to be the “Seventh Claw” of Salama, the Leopard Empire, but imperial forces left fifty years ago and it’s been a lawless borderland ever since. Its main city is Halagad, the City of Mists, and I’ve started to sketch that out. I’ve also got a good draft map of the wilderness which I’ll hopefully show you in a week or two. I’ve been able to square Ximuria’s history with the history of Trollworld from the Deluxe Tunnels and Trolls rulesbook, which for me is both cool and important as I like my campaigns to be consistent and believable, and I really wanted to be able to have characters move easily between, say, Khazan, or Zorr, or any of the T&T solos, and Ximuria. The orientation of Salama–facing the ocean to the west–means that traffic with Khazan (off the map to the east in my mind) isn’t easy, especially with the orc corsairs of Urvang and the perils of the Dragon Reach. But it is possible. Now, to the scenario. It’s called “Blackfear Dungeon”, based on my first Tunnels and Trolls adventure (written when I was 12 years old!). 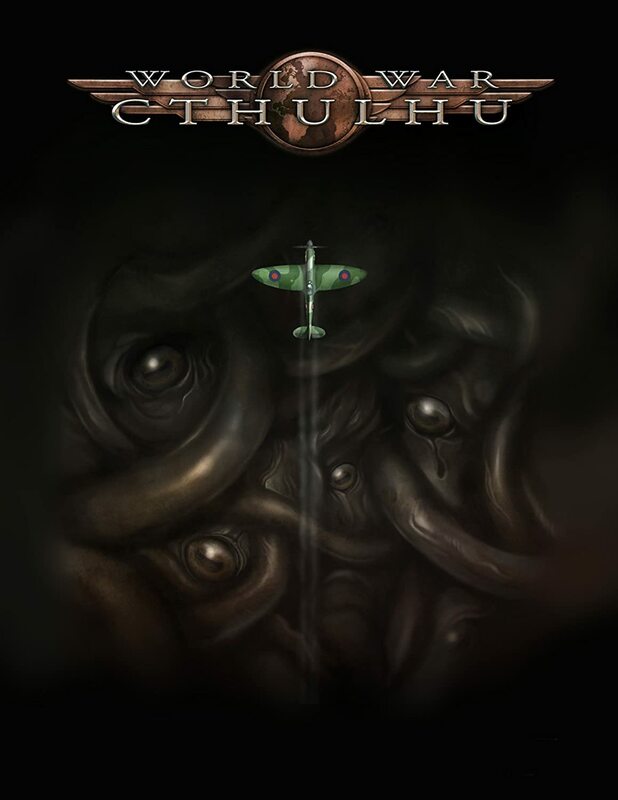 True to T&T scenarios, I wanted it to be a “status quo” dungeon, by which I mean it’s part of the adventurous landscape; a place people know about, fear, and occasionally venture to when they feel brave or desperate. One of the cool things about T&T’s implied setting is that there’s this class of roustabout “delvers”, adventurers who are professional dungeon-plunderers, and that ecology and economy has to make sense in terms of the setting. So, for me that means a very specific tack on adventure design. 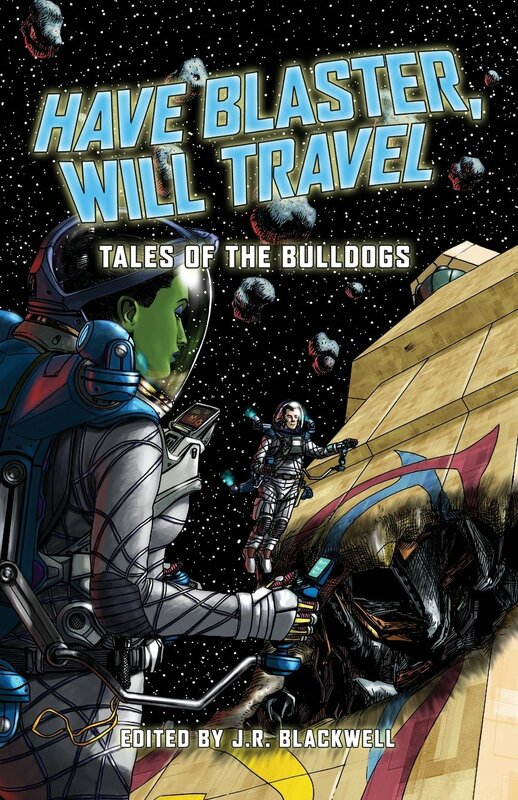 Often when writing adventures, I write about something big going down, a threat to the status quo which propels the whole setting into action. 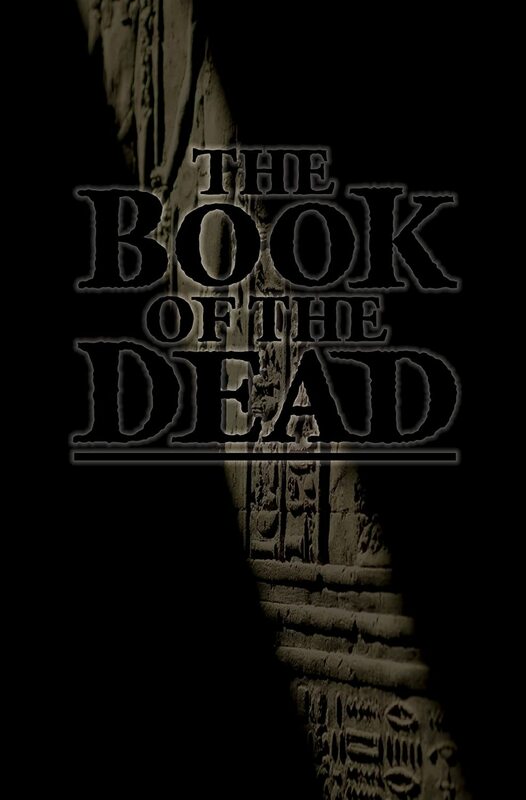 With Blackfear, though, I wanted to try something more in keeping with T&T; to write a dungeon which has been there a while, is dangerous, filled with deadly monsters, legendary treasures, devious traps, and ancient mysteries, but nevertheless makes sense. The above map is part of my attempt to do that. Again, it’s a very basic map, with just some outlines, no colour, and no real detail–but most of the main areas are there. Now that I’ve got the “broad brush” strokes of my Ximuria setting in place, I’m starting to look at how the setting’s currents and forces apply in a more local environment. I know that the city of Halagad seceded from the Leopard Empire for some reason 50 years ago, so that gave me the chance to put my beloved “big thing going down” in the past, rather than the spur for adventure now. 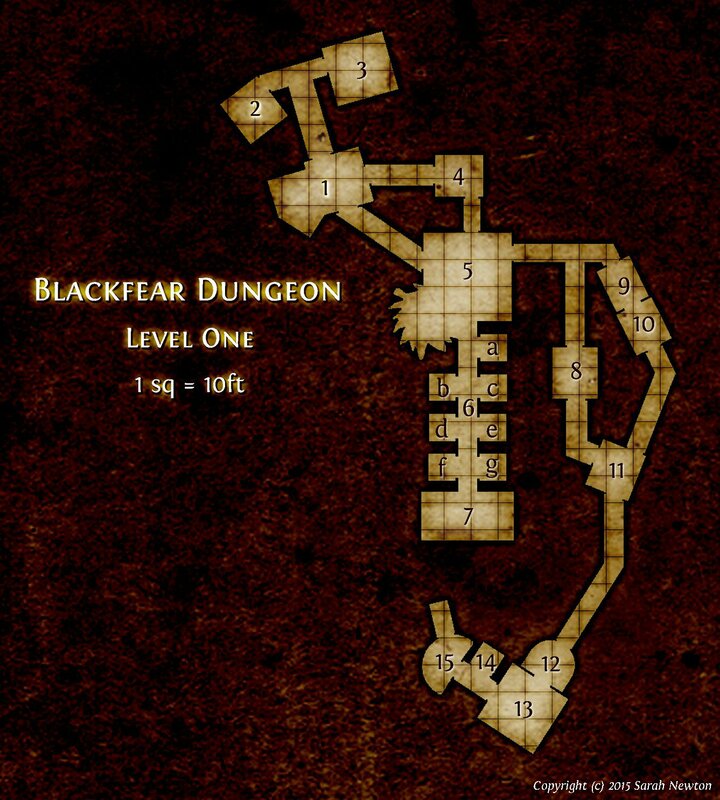 Blackfear Dungeon is situated below Angistoth Castle, the ancient seat of the last Tyrant of the Seventh Claw of Salama, Bayaal the Black. It’s on the slopes of the volcanic range called Gebni’s Anvil (which you can see on the continental Ximuria map just to the left of Halagad), and about 30 miles from the still-smoking volcano of Angismaw, which erupted 50 years ago, on that fateful night of magical duels and lava trolls, when the wizard nicknamed “Blackfear” summoned (or released) a great demon which threw down the walls of Angistoth and–as far as we know–killed the Tyrant. Everyone in the castle perished, but the survivors from the castle village (there weren’t many) fled to the Fanginshield Inn by the Troll Bridge south of the Giantwitch Woods, and started again. Now there’s a village there, called Trollbridge, where adventurers sometimes arrive to brave the demon-addled ruins of Angistoth in search of lost treasures beneath, in the dungeons of Blackfear. So that’s my “status quo” for Blackfear Dungeon. I’m going to mess it up a bit for the adventure proper, but basically I have an “ecology” which (for me at least) makes sense. It’s also taken a lot from the suggested history of the Ximuria setting, and added a lot back to it, which is how I like adventures to work. Last up is a third map, which is my first attempt at a “dungeon map style” for Blackfear Dungeon. I’m not sure whether I’ll stick with it, but it’s working for me right now; it’s basic at the moment, with no doors, secret doors, stairs, etc, and no “decoration”. It just depicts the “smallest” part of the dungeon, the tunnels immediately below the keep of Angistoth Castle where the demon burst forth. My ecology has already thrown up a lot of ideas for what the dungeon rooms originally were (the chambers beneath the Tyrant Queen’s Tower were particularly nasty), and also the implied history since that “Blackfear Night” also gives me ideas for what’s there now; add those two together and hopefully a lot of the dungeon populates itself. I’m imagining there are six levels of dungeon, plus the surface “level zero” of the ruined castle and surroundings. That’s it for now! 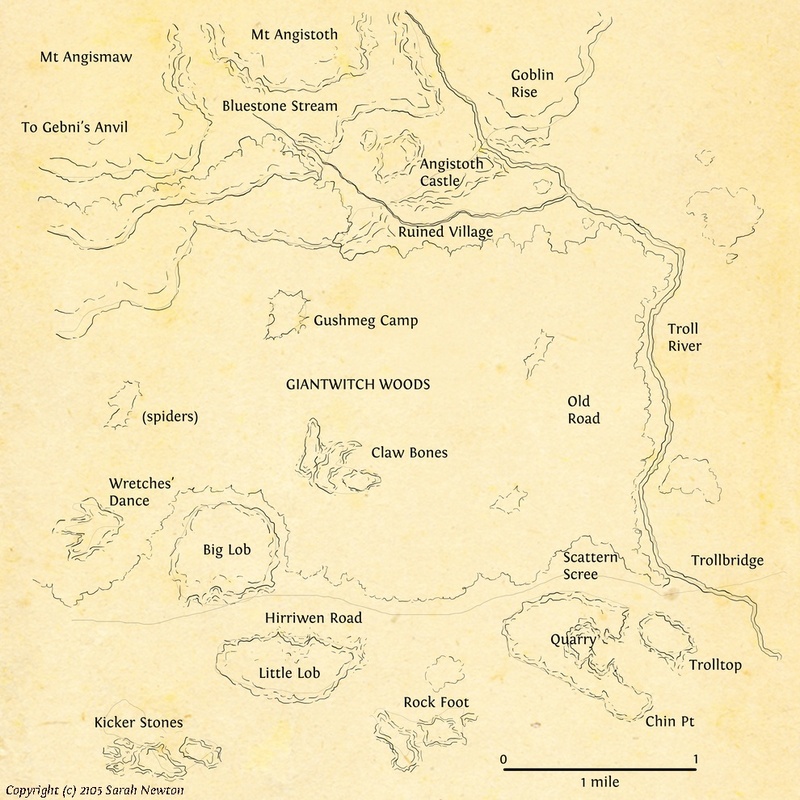 Next up are two more maps; first, a “middle scale” map of the Wilderness of Toth, showing the campaign area, a region about 300 miles by 200 miles; and second that “level zero” castle map of the ruins of Angistoth and its immediate surroundings, including the Trollstones, the stone circle on the hill outside, whose ancient propitiating rites have been carried out since Blackfear Night by an increasingly wizened leonosphinx, and with whom the fortune-telling seeress of the mysterious Gushmegs has just arrived to seek counsel. What’s afoot? Cheers – and happy delving! 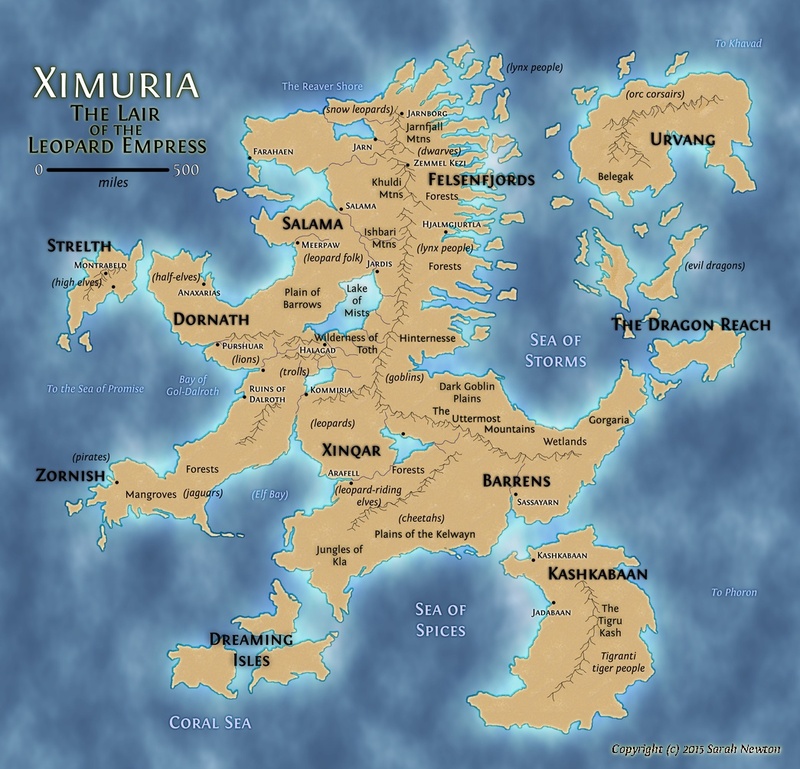 The Ximuria setting is (c) copyright 2015 Sarah Newton. All rights reserved. Deluxe Tunnels and Trolls is (c) copyright 2015 Ken St Andre, Liz Danforth, Rick Loomis, Steven Crompton, and Jim Peters. It’s also available now from www.deluxetunnelsandtrolls.com. This continent would fit right into Trollworld. It looks just like a lion rampant. Great job, Sarah! Lots of good stuff here. I like the anti-vegetarian idea (protecting the plants). Possibly a ritual meal where some of the meat is served raw – an ancient test that the PC’s must pass in order to proceed? Dungeon maps – always interested to see these, although I don’t draw them anymore; I use nodes and connectors to show rooms and links. What do the “monsters” do in the dungeon when there are no delvers? Seriously, though, that is definitely one of my parameters – this isn’t a dungeon where all the beasties are simply sitting around waiting for the adventurers to rack up. It’s a “status quo” dungeon, but it definitely has an ecology. I won’t be making a big deal of it, but it will sit behind everything.